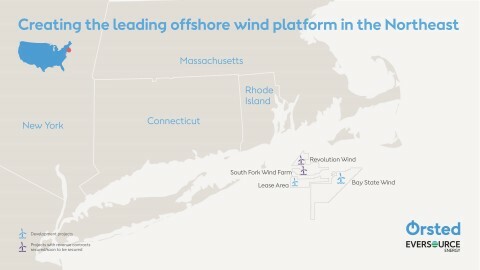 Ørsted, the global leader in offshore wind, and Eversource, New England's largest energy company and premier electric transmission builder, today announced that they have entered into a 50-50 partnership for key offshore wind assets in the Northeast. Eversource is paying approximately $225 million USD for a 50 percent interest in Ørsted’s Revolution Wind and South Fork Wind Farm projects, as well as the 257-square-mile tract off the coasts of Massachusetts and Rhode Island. Ørsted acquired all three assets in November 2018 as part of its Deepwater Wind transaction.